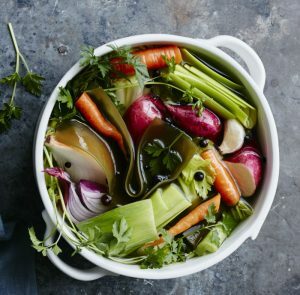 This is a simple, yet great, very detoxing soup that’s very high in essential potassium which helps generate energy, particularly in the brain and also is vital to help your heart create a “heartbeat”. It’s an essential part of any detox program and I recommend having it at night for dinner as part of a lighter evening meal to help your digestion through the night. Also fantastic when you've overindulged and you just want to 'recharge' with a simple meal. You can vary slightly the ingredients if you have some vegetables that need eating. Eat chopped or blended as you wish, hot or cold as well. Add filtered water to cover the vegetables, bring to a boil and then simmer with lid on for 30 minutes. The vegetables should be firm, but not mushy. Remove from heat and serve hot with liquid aminos to taste (approx 1 tbsp) per bowl. Keeps in the fridge for a couple of days or freeze for later.